Deliverance made dead eyes, toothless grins and banjo music both famous and terrifying. The horror story about four city men who encounter some unfriendly locals in the back country was acclaimed and spawned countless imitations. But it was hardly believable. Countryfolk living in isolated parts of America might be used to a slower pace of life or perhaps have extreme right wing leanings. However, a murderous rampage probably isn’t at the top of their agenda. So it’s about time that the scenario was given a humourous makeover. 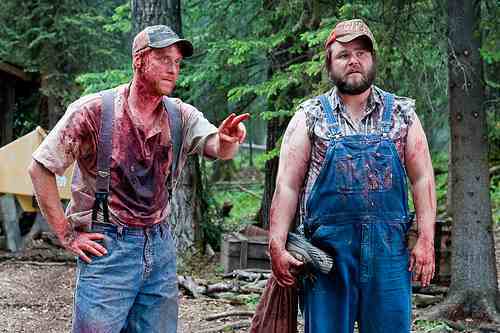 Tucker and Dale vs Evil is a brilliant comedy of errors and perceptions. Dale (Tyler Labine from Rise of The Planet of The Apes) and Tucker (Firefly’s Alan Tudyk) wear dungarees, checked shirts and vacant grins. They are on holiday at their dilapidated mountain cabin when they encounter a group of stereotypical college teenagers. Naturally the youths think the pair are cold blooded killers and when Tucker and Dale rescue one of their friends Allison (Katrina Bowden), the chaos commences as the teens think she has been kidnapped. As the college kids try to ‘save’ their friend, they are dispatched in a number of wild and wonderful ways in hapless accident after hapless accident. Chainsaws, wood chippers…you can see every gag coming from a mile away but it doesn’t diminish the humour in any way. Expect belly laughs. With all the disappointing comedy films of late, this is breath of fresh backcountry air.